Ask yourself a question, what’s the point of eating a nutrient depleted vegetable? The answer is no point at all. By harvesting produce too early and making it sit too long in storage, large chain grocers are preventing the produce from having its full compliment of nutrients.Eating fruits and vegetables while they are at their peak isn’t just a healthier option, but it’s a better tasting one too. Eating a strawberry that has been harvested prematurely, transported thousands of miles and sitting on a grocery store shelf for days is hardly an appetizing idea. Researchers have stated that not only do you get more nutrients from in season produce, but you stand a better chance of avoiding potentially harmful additives like GMOs and preservatives. Eating in season isn’t difficult to do when you learn when each type of produce is at its peak. The USDA has a wonderful tool to help you know which kind of produce is in and out of season, but a larger question remains unanswered. How can you make sure that your diet is getting enough fresh produce? Here are a few simple solutions and adjustments you can make to your diet to help you get those nutrients from fresh produce. Let’s be honest, eating vegetables in the morning doesn’t sound all that great. Fruit however, is amazing in the morning! Here are some wonderful ways to incorporate fruit into your breakfast routine by each season. Pears – A great grab and go option if you are on the go. Blueberries – Cutting up some blueberries and adding them to your cereal is a great way to take advantage of their antioxidants first thing in the morning. Grapefruits – Another great grab and go option. Cut it in half and it already serves as its own bowl. Cherries – If you haven’t had pancakes with cherries on the side, you’re really missing out. Mangos – It’s fair to say that mangos are the ultimate tropical fruit. Again, they make a great addition to your cereal in the morning. Nectarines – Sliced nectarines mixed in with your morning oatmeal will make you never eat oatmeal the same way again. Raspberries – If you have the resources, making your own raspberry jam and spreading it on your morning toast is a real treat. Apples – An apple a day keeps the doctor away! Grab one as you’re headin gout the door and enjoy. Green Grapes – Green grapes make a great side dish for french toast. It brings the flavor out in every bite. Pineapple – Pineapple and cream cheese is a wonderful breakfast dish that can keep your energy levels up throughout the day. Lemons – Lemons aren’t on everyone’s radar as a food, but try cutting them up and adding them to your pancake batter in the morning. You won’t regret it. Pomegranates – Pomegranates make another great oatmeal addition. Tangerines – This cousin of the orange can give your morning cornflakes the yummy taste they’ve been missing. Lunch is a great time to mix up your fruits and vegetables. Where morning is more the fruit appropriate time and evening is more of a time for veggies, mid day is an either/or time for both. Avocado – Yes, and avocado is a fruit. Make your own guacamole or slice them up and put them on your sandwich. Figs – If you like to add fruit to your salads, look no further than a figs to give it an extra special kick. Broccoli – The vegetable of children’s nightmares is actually quite wonderful alongside teriyaki or sesame chicken. Corn – Corn can add a pleasant and tasty crunch to your afternoon salad. Peaches – Peaches are another great grab and go item that make a great side dish to whatever you are eating on your lunch break. Eggplant – Eggplant parmesan chicken sandwich…need I say more? Guava – Guava sweet flavor can make it a wonderful post lunch treat. Green beans – Green beans, like celery, are a great addition to many soups, especially beef vegetable soup. Pomegranate – If you’ve never had salad pomegranate chicken salad before, stop what you’re doing, go to your local Reams, and pick up some pomegranate. You won’t be sorry. Red Grapes – Put some red grapes in your afternoon smoothie and I promise, you’ll fall in love. Parsnips – You can put parsnips on anything really, but they’re especially wonderful on pasta. Like we said before, dinner time is the time when we are more likely to eat vegetables than any other type of produce. By this point in the day, our taste buds are looking for more savory foods than sweet ones. Fava beans – Hannibal Lector’s favorite vegetable is amazing when it’s grilled with a hint of butter. Asparagus – Again, another great vegetable to grill. Add a little lemon juice while its cooking and let it soak up the flavor. Carrots – Orange glazed carrots should be on everyone’s Thanksgiving table. If you haven’t tried them before, you really need to. Summer Squash – You can incorporate summer squash into almost any type of casserole. Beets – Beets may not be very good on their own, but when you combine them with other vegetables, they can add a special flavor to almost anything. Collards – Collard greens and rice can give you a “just how mom used to make” feeling if they are done the right way. Horseradish – Either people love it or they hate it. Those who love it cant resist putting horseradish sauce on their bratwurst. Kale – This popular superfood is especially wonderful in pasta salads and casseroles. Mushrooms – If you’ve never added fresh mushrooms to your holiday gravy, you’re really missing out on an epic gravy experience. Chile Peppers – What better way to stay warm during winter than by cooking stuffed peppers? Sweet Peppers – Sweet pepper potatoes are the ultimate compliment to any chicken dinner. Cauliflower – Cauliflower is a great way to make your biscuits more healthy. Just puree them and add it to your batter. Those are just a few examples of how you can incorporate fresh produce into your diet. First and foremost though, you have to be able to trust your grocery store to carry the kind of fresh produce you would need to get the most out of those suggestions. All 8 Reams Food Store locations receive fresh deliveries of produce every day, so you can be assured that what you see on the shelves is as fresh as possible. 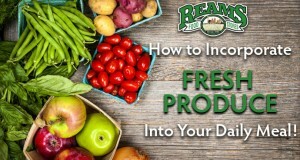 At Reams, we take pride in the fact that our produce is locally grown and harvested at the peak of its freshness. Come on in and taste the freshness for yourself!